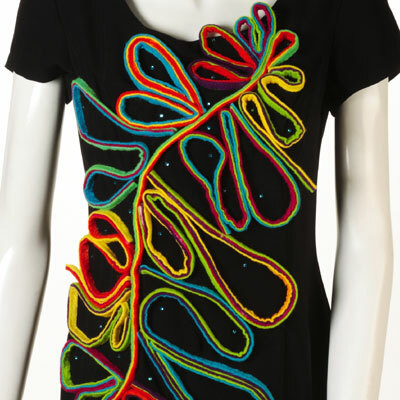 This squiggle design from I Love to Create is sure to make anyone's eyes crazy. A plain black sheath dress is always greatly accented by felt and tie-dye, which makes it one great piece to make. Prewash dress to remove sizing. Do not use fabric softener or dryer sheets. Place felt into washing machine and let it agitate until completely soaked. Run felt through washer drain and spin cycle. Remove wet felt. Cut into seven equal pieces. Cover work surface with garbage bags. Place felt pieces onto work surface, spacing them a few inches apart. Wearing rubber gloves, add water to dye bottles. Replace caps tightly. Shake until dye is dissolved. Squeeze a different color of dye onto each piece of felt, saturating completely. Cover with garbage bags. Let set 4 to 6 hours. Wash lighter colors in a large load of water with a small amount of laundry soap. Fill washer full of water before adding dyed fabrics. Repeat procedure to wash darker colors. Dry in dryer. Cut felt into 3/8” wide by 24” long strips, using cutting mat and rotary cutter. If ends do not lie flat, cut them off. Cut strips only from flat area. Glue three different colors of strips together, keeping long edges even. Make 20 to 25 glued strips. Let dry. Place flat sheet of foil inside dress to keep glue from seeping through fabric to other side. Draw a line across front of dress at an angle, using chalk pencil. Apply a bead of glue along chalk line. Place a felt strip onto wet glue, placing so that all three colors of felt can be seen. Glue strips to each side of line to create design. Prepare Heat-Setting Tool. Position a Crystal where desired inside each loop. Gently touch tip of Tool onto top of each Crystal for 5 to 6 seconds to adhere. Wait 72 hours to wash. Machine wash warm on gentle cycle. Do not use harsh detergents or bleach. Remove promptly and line dry. To iron, turn garment inside out, being careful not to touch design with iron. Do not dry clean.